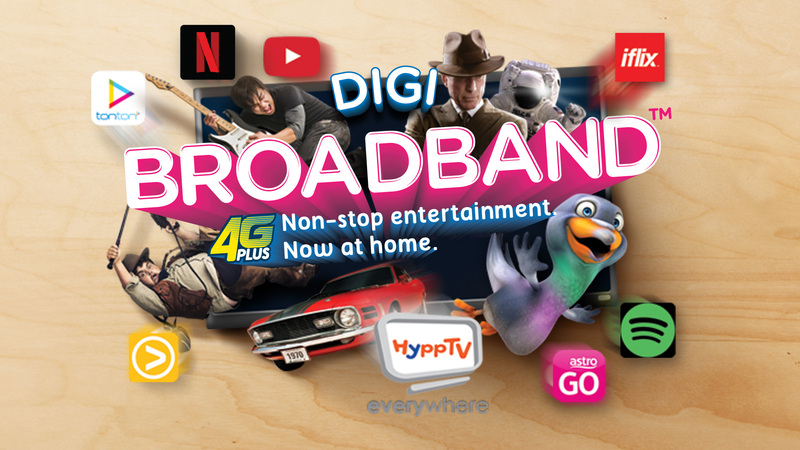 Subang Jaya, 15 November 2016 – Digi Telecommunications Sdn Bhd (Digi) today announced the availability of its latest home broadband plans that offer customers ample internet quota for streaming movies, TV shows and music from the comfort of their living rooms. The new Digi home broadband plans address Malaysians’ changing demand for digital content. Malaysians are increasingly moving towards digital entertainment that allows them to watch content whenever and wherever they want rather than remain tied to time belts. All new Digi Home Broadband plans come with 19 free streaming channels partners at the moment including popular streaming services YouTube, Dailymotion and a slew of Astro’s and Media Prima’s radio stations. Those using any of these channels can stream for free without using up their monthly internet quota. Customers can also look forward to enjoying live and on-demand content and offers from top content providers like dimsum which streams the Best Asian content, iflix, Netflix, Astro on the Go, Tonton, HyppTV Everywhere, Viu and HeroTalkies. Music streaming partners in this Digi Broadband offer include Spotify, Sing! Karaoke by Smule, Deezer, Raku, Apple Music, Joox and many more. Customers who sign up for the new plans now get a 30-day access to 11 premium channels on Astro on the Go for free and 2 months full access to iflix (worth RM20), sponsored by Digi. The new Digi Home Broadband plans are affordably priced at RM30, RM60 or RM100 and give customers the flexibility of choosing either a prepaid or a postpaid payment method depending on the plan. The plans come with 6GB, 20GB and 50GB internet quota respectively. Next : Telenor Launches The Valyou Mobile Wallet!